I’m fresh back from a week in Iceland. Hard to enter a room these days and not have at least one other person claim the same; it’s the touristic destination du jour. A tiny nation where sheep outnumber people is bound to be an environmental nirvana. Go there for the Northern lights, active volcanoes and spewing geysers. Soak in its geothermal pools, and soak up its rugged terrain blanketed beneath thousands of richly colored lichen. The national treasure is uber-clean air that burned the lungs of this writer who spent six years in the dust, diesel, and nicotine-laden atmosephere of Amman, Jordan. Just when I think I can’t love Iceland any more, I see this.In the tiny fishing town of Ísafjörður in northwestern Iceland, an exciting development in road safety has just been installed. It’s amusingly eye-catching yet seriously functional. 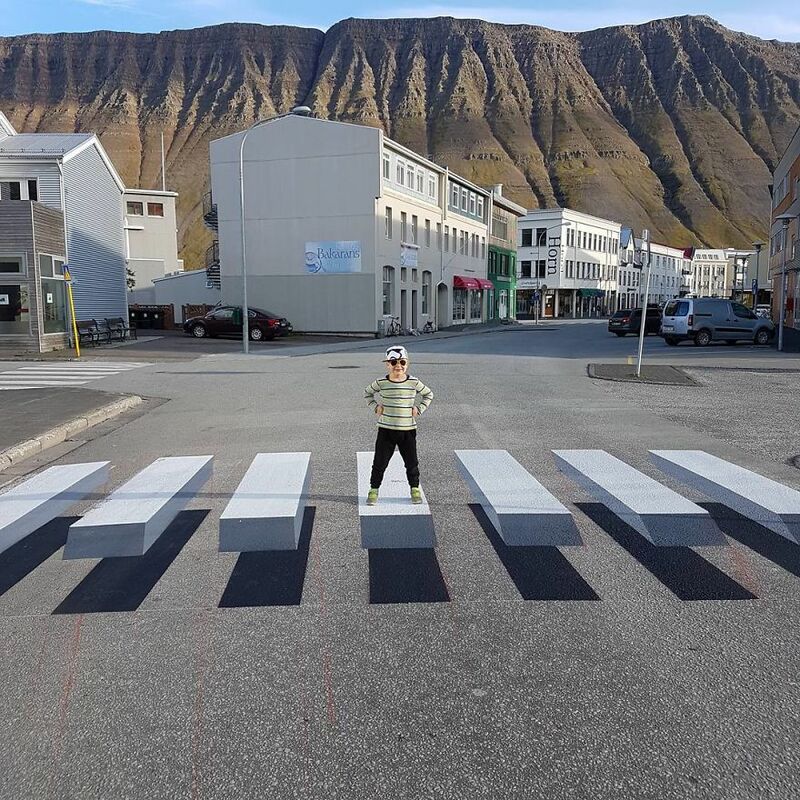 A new pedestrian crossing has been painted in a way that transforms it into a cleverly-detailed optical illusion where a ubiquitous “zebra-stripe” crosswalk appears as a series of concrete slabs, apparently hovering above the concrete road bed. The innovative design gives pedestrians a feeling of walking on air, and more importantly demands the attention of drivers, who will be sure to slow down their speed once they spot the seemingly floating infrstructure. Icelandic environmental commissioner Ralf Trylla had seen a similar project being installed in New Delhi, India. 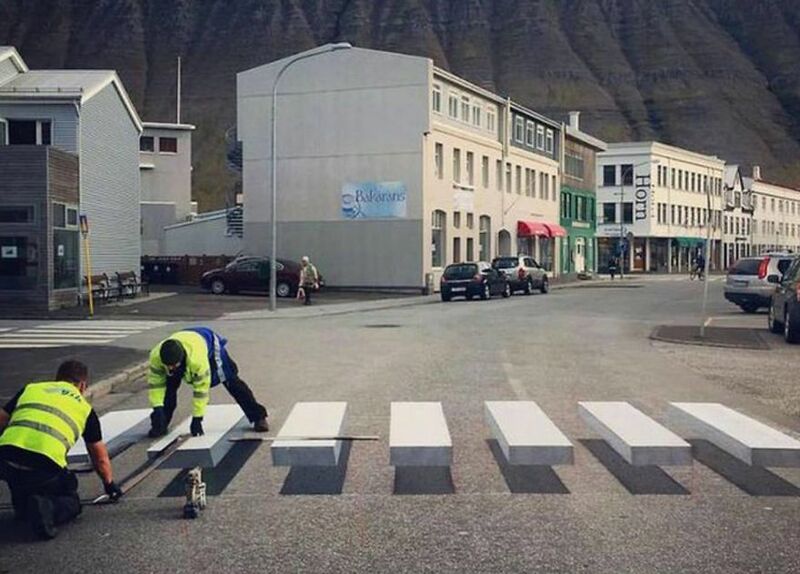 With the help of street painting company Vegmálun GÍH, he replicated the installation in Ísafjörður. We’ve seen the power of guerilla artworks in Istanbul, and massive murals across the facades of a Cairo slum. Art has the power to delight, inspire, and instigate change. Who’s streets wouldn’t be safer with a paint slap-on like this? Ísafjörður,in the Westfjords region of northwest Iceland, is known for its dramatic landscapes. The old town has a population of about 2,500 people and features wooden houses with corrugated tin roofs built by fishing merchants in the 18th and 19th centuries. The Westfjords Heritage Museum has exhibits on the town’s maritime history, including a collection of old fishing boats. The old hospital, now a cultural center, contains archives and photography. And – just as in the whole of Iceland – it does not contain a McDonald’s. Iceland, will you marry me? Previous Previous post: Ktak drum is a snare you can wear!